Home » About Book Blogging » Yeah sirsi! Sirsi is where the emails come from to let me know that books I’ve reserved at the library are ready to be picked up! Yeah! So tonight after work I sat down with the last forty pages of “Faking It” by Jennifer Crusie and then headed to the library to pick up “One Day” by David Nicholls (finally!) and “Juliet, Naked” by Nick Hornby. I find the Rochester Public Library a little difficult to navigate. Well, maybe not difficult to navigate but overwhelming. Summer of ’09 I started with the fiction in the Zs, thinking I’d work backwards, and I read quite a few fun books, but soon that didn’t work for me. This past summer I referred to my goodreads TBR account via my smart phone and would look for specific books – either on the shelf or in audio version – but very rarely would I find them shelved! So this winter I’ve gotten a little smarter and I started reserving the books so that when I go in I just need to go to the reserve shelf and check out! It’s nice to be able to get exactly what you’re looking for sometimes – but there is also something about wandering around in the stacks, too. I’m sure I’ll do a little of both – reserve and wander. 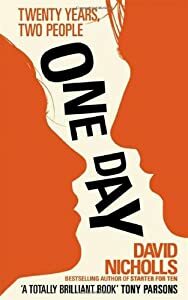 I didn’t know “One Day” was going to be made into a movie, coming out in July! “Faking It” was a fun easy read. Not great but witty. I’m falling behind in my magazine reading. I’m not going to fall into the meme trap again – I hope. Maybe I’ll come up with my own weekly blogging themes – I do love themes, after all! Not that I’d ever blog every day, but how about Saturday or Sunday Smorgasbord? Monday Musings? Teatime Tuesday? Thursdays Thoughts? Ugh… ideas welcome! “Water for Elephants” will be out in the theatres before we know it! I’m super excited to watch the Oscar’s this year! I think that’s all for tonight! My TBR list now includes: “One Day,” “Juliet, Naked,” and “Plain Truth” – probably in that order! Book club discussion for “Plain Truth” is March 8 so we’ll see if I need to rearrange the order. Good times! I love to read and talk about books! This entry was posted in About Book Blogging, General Book Talk and tagged David Nicholls, Jennifer Crusie, Juliet Naked, Nick Hornby, One Day, Plain Truth, Rochester Public Library, United States. Bookmark the permalink.